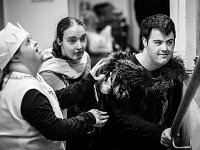 Last year Sheffield Theatres worked with a group of 10 adults with learning disabilities and/or autism and they created a show that was performed in their Studio. This year the project has developed further into running 5 weeks of skills development workshops before going into the process of making and performing a show. The deadline for applications is Wednesday 3rd January 2018.